The Fire Department Safety Officers Association (FDSOA) Annual Apparatus Maintenance & Specification Symposium will celebrate its 30th Anniversary in January 15-17, 2018, in Scottsdale, Arizona. The first symposium was created after a series of meetings initiated by the International Association of Fire Chiefs’ staff, fire chiefs, several state mechanics’ associations and the Fire Apparatus Manufacturers Association to address issues concerning apparatus, maintenance and maintenance personnel. In 1988, the first Apparatus Maintenance & Specification Symposium was held in Fort Worth, Texas, through the efforts of Fire Chief Larry McMillen, Fort Worth Fire Department, Bob Barraclough, Span Instruments, and Mary McCormack, International Society of Fire Service Instructors (ISFSI). In 1989, after the Fire Department Safety Officers Association (FDSOA) was established as a subsidiary of the ISFSI, the Apparatus Symposium was moved to a hotel on Sandlake Road in Orlando, FL. The symposium was designed to be educational and limited to table tops, not exhibits. Topics covered a range from preventive maintenance efforts to issues of liability and new safety standards. As the conference grew, it moved to the Rosen Plaza hotel on International Drive. In 2013, the FDSOA headquarters were moved from Massachusetts to Michigan, and the Apparatus Symposium and the annual Safety Forum are co-located and held the same week, alternating between Orlando and Scottsdale, AZ. 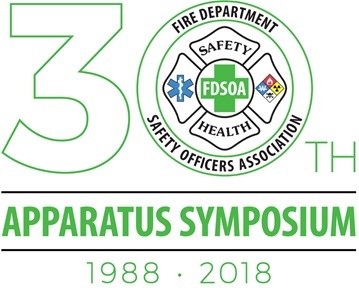 The 30th FDSOA Annual Apparatus Maintenance & Specification Symposium will feature keynote speakers: Brad Pinsky, attorney and fire chief; Garry Briese, executive director, Colorado State Fire Chiefs; and Chief Bruce Varner (Ret.). Contact: For further details: Rich Marinucci, email: fdsoa@fdsoa.org Exec. Dir.